A man arrested in Thailand this week on charges of stealing millions from online bank accounts fits the profile of a miscreant nicknamed “bx1,” a hacker fingered by Microsoft as a major operator of botnets powered by the ZeuS banking trojan. 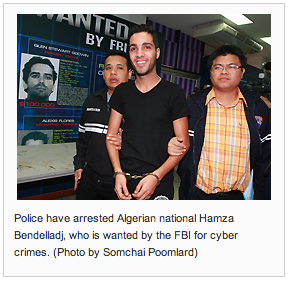 As reported by The Bangkok Post, 24-year-old Hamza Bendelladj, an Algerian national, was detained this weekend at Bangkok’s Suvarnnabhumi airport, as he was in transit from Malaysia to Egypt. This young man captured news media attention when he was brought out in front of Thai television cameras handcuffed but smiling broadly, despite being blamed by the FBI for hacking into customer accounts at 217 financial institutions worldwide. I didn’t fully appreciate why I found this case so interesting until I started searching the Internet and my own servers for his email address. Turns out that in 2011, I was contacted via instant message by a hacker who said he was operating botnets using the Zeus and SpyEye Trojans. This individual reached out to me repeatedly over the next year, for no apparent reason except to brag about his exploits. He contacted me via Microsoft’s MSN instant message platform, using the email address daniel.h.b@universityofsutton.com. That account used the alias “Daniel.” I later found out that Daniel also used the nickname bx1. (12:31:35 AM) Brian Krebs: ?